Not too long ago, several Earth-sized planets were found orbiting TRAPPIST-1 (see this astrobite for more details). This star-planet system is exciting not only because it has a few terrestrial planets in the Habitable Zone but also because the system is somewhat close to our own solar system, at a distance of about 12 parsecs. 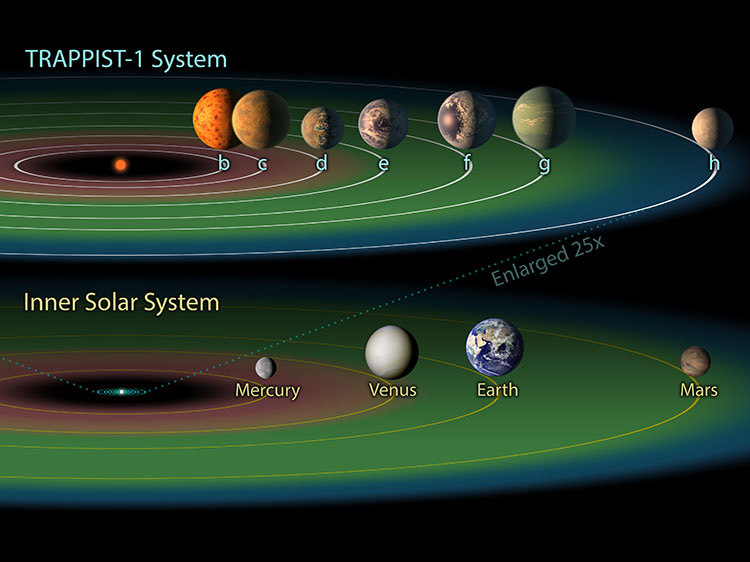 There are seven planets in this system, but the authors of today’s paper focused on the four in the Habitable Zone – d, e, f, and g. An artist’s conception of the TRAPPIST-1 system, as compared to our own inner solar system, can be seen below in Figure 1. Observing exoplanets is challenging! So how can we ever imagine learning something about their seasons? Over the past decade, astronomers have made extensive progress in understanding the atmospheres of hot Jupiters including weather detections. But hot Jupiters are tidally locked and therefore experience no seasons. For observations of seasons, we need to push outwards to planets on longer orbits, where tidal interaction with the star is minimal. But a longer orbit means cooler planets. Cooler planets emit less thermal radiation making them far dimmer than hot Jupiters, with blackbody spectra that peak at longer infrared wavelengths. This population of “warm Jupiters,” or Jupiter-sized planets with temperatures between 500-1000K, are out of reach for current telescopes. But with the James Webb Space Telescope’s 6.5m mirror and its ability to observe out to longer wavelengths than current telescopes, astronomers will soon be studying the atmospheres of this new population of exoplanets! When the lights went on. The Epoch of Reionization (EoR), as its name suggests, is the relic of a very ionizing (read exciting) time in the evolutionary history of our universe. It is the time when the first stars are thought to have lived and died, as light emerged in the darkness of the cosmos, for the first time after recombination. Leading up to this point, the universe had been unobservable for millions of years due to the presence of neutral hydrogen that blocks any high energy photons capable of ionizing the medium by absorbing them. However, something during the reionization epoch provided enough light to strip the electrons off of all the existing neutral atoms, making it possible to peer back into the formation of first stars and galaxies. Stars dutifully fuse hydrogen into helium throughout their main-sequence lifetimes, while planets quietly fuse nothing at all. 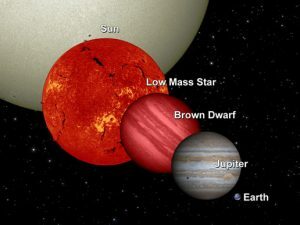 In between these two extremes—large and hot enough to fuse deuterium but too small and cool to process its lighter cousin, hydrogen—lie brown dwarfs (see Figure 1). Like giant planets, they have cloudy atmospheres and sport polar aurorae. Like stars, they are powered by nuclear fusion, but unlike stars, they cool as they age, which could have interesting implications for the development of life on planets orbiting around them. In 1835, the philosopher Auguste Comte wrote that “we shall not at all be able to determine [stars’] chemical composition or even their density.” A few decades later, it turned out that Comte was wrong, thanks to a newfound ability to separate stellar light into its component wavelengths. This is called spectroscopy, and it provided the first major breakthroughs in our understanding of stars. Today’s paper combines a wide range of data sets—spanning the radio to near-infrared—and analysis techniques—orbit fitting and hydrodynamic simulations—to connect a binary companion to intriguing features seen in the protoplanetary disk around the primary star. The detection of extraterrestrial intelligence is a quest that has fascinated astronomers since we first realized that there were worlds beyond our own. Listening projects, like SETI@home and Breakthrough Listen, look for possible signals from other civilizations. Such a discovery would unequivocally prove that we are not alone. However, in order to efficiently transmit a message across interstellar space, a civilization would likely beam it as tightly as possible towards its destination. That means that we wouldn’t be able to eavesdrop if we weren’t in line with the beam. Dear readers, let’s begin with a cheerful thought for the start of northern hemisphere springtime: Think of the delightful lengths people have gone to to find out what the Moon is made of. We’ve taken pictures. We’ve gathered rock samples. We’ve driven a little car around on it. We’ve even crashed a spacecraft into the surface to kick up moon dust to analyze. All of this effort has told us an extraordinary amount–we now hypothesize that the Moon is a big old chunk of Earth, sheared off in a collision between a young Earth and a mysterious protoplanet in the early days of the Solar System. We know that it’s rich in water ice, which is good news for would-be lunar settlers. We know that its surface once flowed with magma. But if we want to know more, we have to be even cleverer. We have to look at the Moon in new ways, through new lenses, with new telescopes. In 1998, NASA’s Lunar Prospector mission did just that, taking photos of the moon in gamma-ray light, the most energetic category of light that astronomers observe. When galaxies were first discovered, they were sometimes called “island universes.” It’s actually a pretty apt comparison—like islands, galaxies are complex systems with lots of individual components. However, the word “island” is sometimes associated with isolation. “No man is an island entire of itself” goes one famous poem; over the last several decades, astronomers have come to realize that no galaxy is an island, either. Galaxies themselves interact with each other and with their environments, and understanding how this happens is one of the main questions in galaxy evolution. Studying dwarf galaxies may be one way to answer this question. These small, dark-matter dominated systems—miniature islands—are particularly susceptible to external interactions. 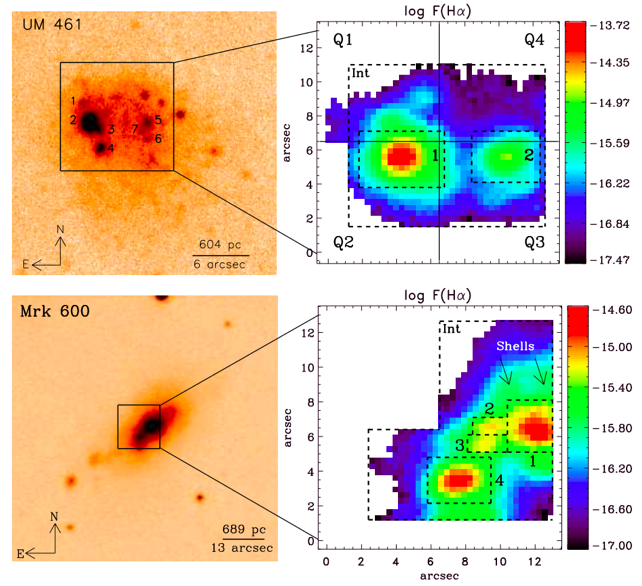 Also, under the current paradigm of hierarchical galaxy formation, larger structures are made of smaller structures—so dwarf galaxies are also the building blocks of larger galaxies. All these factors make dwarf galaxies good test beds for studying the role of environmental interactions in galaxy evolution. Hot Jupiters are the one family of exoplanets that has continued to challenge our understanding of planetary systems, ever since they became one of the first types of exoplanets to be detected. Their relative size, mass, and proximity to the host star make them the easiest exoplanets for detection and atmospheric characterization, especially from ground-based instruments. No wonder that recent wide-angle surveys from the ground (WASP, KELT and MASCARA to name a few) have been quite successful in finding these gas giants, some of which are orbiting early type bright stars. Atmospheres of hot Jupiters around such bright stars are blasted with a significantly high amount of radiation on their day side. Observations using the technique of transmission spectroscopy have revealed some surprising features of the vertical structure and chemical composition of these atmospheres. Today’s paper focuses on the atmospheric properties of one such gas giant — WASP-18b — which is in a tight, 0.94-day orbit around its host star and which has a scorching equilibrium temperature of 2700 K.
Recent studies of some of the very-hot Jupiters suggest the presence of thermal inversion in their atmospheres. This is akin to what happens in the earth’s stratosphere due to the presence of ozone. In the case of hot Jupiters energy from stellar irradiation is absorbed by the presence of gas phase TiO and VO. While thermal inversion is not totally unexpected in these atmospheres, the anomalously high values of metallicity and C/O ratio (frequently used indicators of chemistry and abundances in exoplanet atmospheres) that are constrained by the models that best explain these observations suggest that there is more to this than meets the eye. 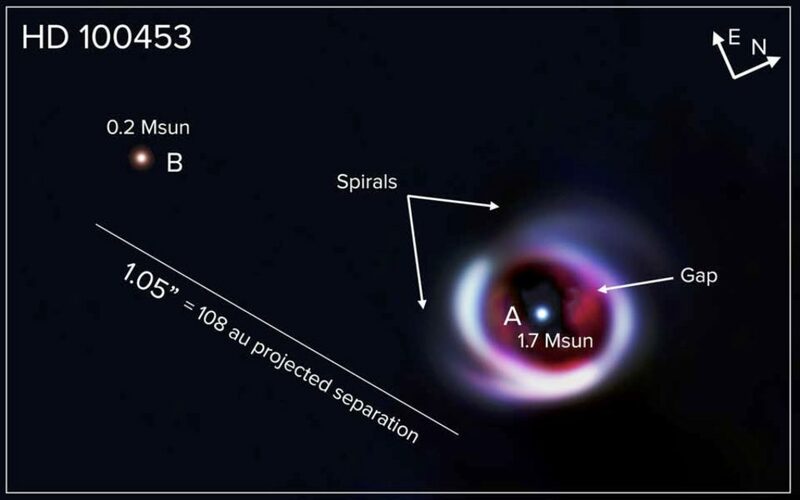 Today’s paper tries to resolve this issue by taking a cue from the conditions in stellar photospheres which are at effective temperatures similar to those of very-hot gas giant exoplanets. Science requires collaboration, and often that collaboration leads to projects that span across different fields of science. This paper caught my eye mainly because the Colorado Plateau is one of my favorite places to travel, and though I’m not a geologist, its unique and beautiful rock formations have always piqued my interest. As I read this paper, I was surprised to find that this author also was not a geologist by trade. Xiaolei Zhang is an astrophysicist, but decided to carry on her late father’s unfinished project to uncover the formation of the Colorado Plateau and the possibility of giant-impact-plate tectonic motion. By looking at planetary geology through an astronomer’s lens, it is clear that though discoveries of exo-solar planets are exciting, sometimes discoveries about humanity’s first known planet can be just as intriguing. There are still many things to learn about our home planet Earth. For example, geographical features on Earth can tell us about its astronomical history— its track record with meteors and other space debris. A Mars-sized object? Really? Shouldn't that have killed all life on the Earth, only 750 million years ago? This idea seems radical in the extreme. Was there an almost total global extinction event 750 mya? She proposes that a mars sized rogue planet hit the Earth in what is now the North American continent which lead to the formation of the Colorado Plateau. Chris, with your backgrounds in both astronomy and geology, I'm wondering if this proposal seems impossible to you also. PS: I see that Ann questions this as well. Therefore there's no way it could be true. Partly answering our question, there is no mass extinction event in such lists at 750 mya, but then again there wasn't much (if any) complex, multicellular life on Earth prior to the Cambrian Explosion 541 mya. The Cambrian explosion or Cambrian radiation was the event of approximately 541 million years ago in the Cambrian period when most major animal phyla appeared in the fossil record. It resulted in the divergence of most modern metazoan phyla. The event was accompanied by major diversification of other organisms. BDanielMayfield wrote: PS: I see that Ann questions this as well. Therefore there's no way it could be true. Seriously though, if a Mars-sized object had hit the Earth 750 million years ago, shouldn't the oceans have been vaporized, so that all marine life died, too? Yes indeed Ann. I think that an impactor that large would have been anough to completely sterilize all life on Earth. There isn't fossil support for this notion. The paper mentions that there was not yet a biological fossil record, and, incredibly, indicates that perhaps a couple of oceans were formed due to the collision, rather than destroyed. Interesting stuff. There was certainly a fossil record in place during the late Proterozoic! The Colorado Plateau is a rich source of fossils going back at least 1.2 billion years. And it has intact limestone bedding going back more than a billion years which is unshocked. The author of this paper would benefit from some serious peer review. Her analyses of the impact energy, of the orbital dynamics, and of the geology is primitive at best, and incorrect at times. She seems to simply spend her time writing unreviewed papers like this (she has another on quantum consciousness). She has some kind of affiliate faculty status at GMU; she's not part of the regular faculty. I find it hard to take the paper seriously. I thought when she wrote "biological" she meant larger organisms, although I wasn't sure why she wouldn't have written that. Most astrobites are tasty morsels, but this one wasn't. I have no knowledge of the fossil record from a billion years ago or so, and I don't understand geology. But the whole hypothesis seemed too preposterous to me. Haven't we been told that the Earth was pretty much vaporized as it collided with a Mars-sized object some 4.5 billion years ago? And now a second collision of the same magnitude would have happened only 750 million years ago, leaving the Earth mostly unscathed? And life on Earth would go on as before? Like I said, it seems preposterous. You all are right. I'm used to Astrobites being a fairly reliable source of good morsels. I let my guard down. I wonder why this was posted, now.